Barbie Photo Fashion Doll: Lights. Camera. Fashion! Barbie Photo Fashion Doll combines fashion and photos with a simple click. 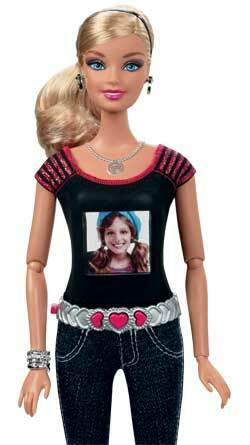 The Barbie doll is actually a digital camera and Barbie doll’s shirt is where the digital image will appear. Girls can select from pre-loaded graphics or take their own pictures to change the image on Barbie doll’s tee. With the ability to add frames and effects to photos and make your own slide show – see what happens when you play with Barbie. Once images are downloaded and saved to a computer, the camera memory is freed allowing for more photo fun. Website with Barbie imagery lets girls customize images taken with their Barbie Photo Fashion Doll. Barbie Photo Fashion Doll can hold more than 100 images and features an internal rechargeable battery. Includes Barbie doll with embedded digital camera and LCD screen, stand, USB cable, rechargeable battery and instructions. A digital camera and fashion doll in one! Now girls can customize Barbie doll’s graphic t-shirt with pictures they take — using the lens built right into the doll! Display your favorite image or show them all in slideshow mode. If You Can Picture It, Barbie Doll Can Wear It! For the first time, girls can customize Barbie doll’s t-shirt with original photos and change the pics to fit any occasion — all with the press of a button! This super-cute doll has a special embedded camera lens, so when girls point and shoot, the image projects onto Barbie doll’s shirt, creating the trendiest graphic tee. By using the viewfinder built into the doll’s back (and disguised as part of her necklace), girls can make sure they get the best photos possible. Customize Barbie doll’s tee in a snap! Take a photo by pressing the button that doubles as the doll’s belt buckle. The image instantly displays on the LCD screen on the doll’s shirt. Choose fun effects! Press the buttons on Barbie doll’s belt to add backgrounds/frames/graphics and change colors. Share with family and friends. Girls will love showing off their cool photo-real designs and can even put the doll in slideshow mode to mix up her look! So Many Design Choices and More Online! Barbie Photo Fashion doll provides hours of creative playtime and allows plenty of digital storage, with the capacity to hold 200+ original photos. 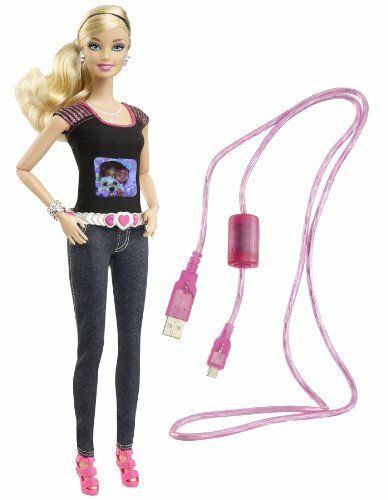 For more design options, your techie girl can plug the doll into a computer (with the included USB cable) and further customize her photos — add even more graphics (such as a glam tiara! ), backgrounds, and more. When done, upload the pics back to the Photo Fashion Doll and treat Barbie to a new graphic tee! Barbie doll with embedded digital camera and LCD screen, doll stand, USB cord, rechargeable battery, and instructions. 11.5-inch Barbie doll is ready for photo fun right out of the box! Connect to a computer to recharge or upload and download images with the USB cable — pink, of course! TeleTubby Barbie? I have to say the folks behind Barbie never cease to amaze me. I can’t think of too many other toy brands that have been able to consistantly change with the times and accomodate the next generation’s wants, while still keeping the basic product almost the same as when it was first introduced?The Barbie Photo Fashion Doll is just the latest innovation which has captured my daughter’s imaginatino. Basically the doll this go around is also a digital camera. Yes, the doll is the camera. With the lens cleverly disguised as a necklace, my daughter has been going around snapping shots of her puppy, boxes of crayons, leaf piles and almost every other thing in the house (including a series of pics of an increasingly annoyed older brother). The Barbie Photo Fashion Doll comes with a simply USB cable that allows you to hook up your Barbie to your PC so that you can transfer the pics taken. And I will say that the camera actually takes a decent photo, at least on par with your standard cell phone camera.The real draw for my daughter to this doll though is the ability to change the design on Barbie’s T-shirt. Sort of like a Teletubbie, the Barbie Fashion Doll has a small viewing “window” on her belly where you can change the design which is shown on her shirt. You can cycle through a bunch of pre-loaded images, or change the picture to one you’ve taken with the camera.This is a pretty clever idea, and pulls Barbie into the digital camera age in a unique way. Your little girl will have hours of fun with this doll. So awesome! I tell you they just keep making this barbie stuff prettier and cooler. I just love this doll. It is so very cool how the picture your child takes becomes a design on her shirt. I also like how they put the buttons on her belt so they do look funny. This is a great toy to inspire creativity. Who knows you might buy this for your kid and she grow to love fashion, picture taking, or modeling. She might even grow up to be a fashion designer or a photographer from playing with this toy. Great gift Giftee was a 6 year old girl and she LOVED it… I would recommend this item highly. Great price, too.